Second, you need to have a bluetooth keyboard or other device, like headphones, speakers, or earbuds. This is a picture of a Jawbone earpiece I've successfully paired to my Kindle Fire and been able to listen to music with. When you've got both of these items you're ready to connect them together! 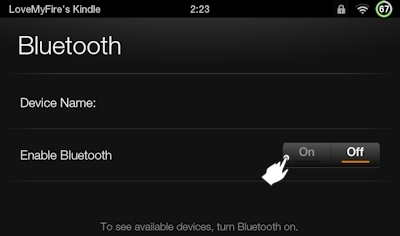 Turn on your Kindle Fire, unlock it, and slide down the top menu. 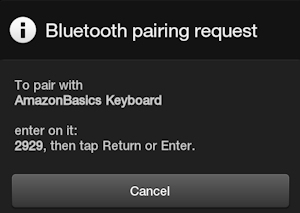 If the pairing request doesn't pop up, or you get an error, push the connect button on your keyboard and tap the "AmazonBasics Keyboard" again. There's a short time frame that it searches so if it misses it, just try again. Follow the instructions by typing the four digit number (the one shown on YOUR screen, not in the image above), followed by the Enter/Return key. You should also see the bluetooth icon at the top right of your screen, just to the left of the Wi-Fi and battery icons. Yippie! It's ready to go! Now's the fun part, testing it out! You can go to the web or just tap the search icon at the bottom right of the keyboard and start typing away. The volume + & - keys work great too, which are also found at the bottom right corner. Don't miss the unique Home and Back Arrow keys (bottom left) and the Menu key (top left) which match the icons on your Kindle Fire. There are arrow keys for moving within a block of text, but they also work to move a box around the screen so you can select a feature right from the keyboard! For example, if you push the Home key and then the right arrow on your keyboard you'll see a blue box around an item. You can also use the Tab button to cycle between each screen's menus. Just hit the Enter/Return key to select that item. 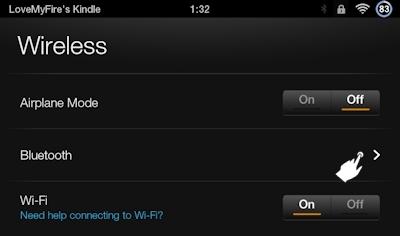 You can also unlock your Kindle Fire with your keyboard. Tap the menu key (box with horizontal lines at the top left) and enter your password! To turn off your keyboard, just flip the switch on the underside of your keyboard. The icon will still show up under your "Paired" bluetooth devices, but it will no longer be "Connected". When you're ready to use it again, switch it back on, tap any key on the keyboard and it will automatically reconnect within a few seconds. This is an easy way to save battery power. Just turn it on when you want to use it and then remember to turn it off when you're done. If you want to unpair or rename the device on your Kindle Fire, just tap and hold down until a window pops up letting you "Unpair" or "Rename" it. Be sure to see my other Kindle Fire tutorials for lots of great ways to enjoy using your tablet! If this tutorial has helped you, please let me know in the comments below! 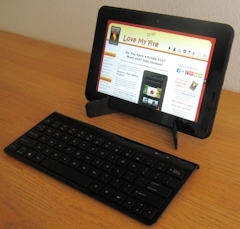 I'd love to hear of any Kindle Fire keyboard tips you figure out too.